Want to be notified of new releases in kirschbaum-development/nova-inline-select? This package contains a Nova select field that can update field values inline from the index and detail views. This Nova field requires Nova 2.0 or higher. By default, the inline select field works just like a normal select field. To enable the inline editting capabilities we can use the inlineOnIndex() and inlineOnDetail() methods. Now the above inline select field will show up on both the index and detail views. When making a change to the select field, a button will display next to the field allowing you to commit the change. If you would prefer the field to auto-submit the change, just add disableTwoStepOnIndex() or disableTwoStepOnDetail(). Now changing the select field on the index view will auto-submit the changed value. This method works just like Nova's select field. It will display the option value rather than the option key. In the case where fields on a model are required, which is likely, an extra step needs to be taken ton ensure the inline select update persists and doesn't throw an error. The validation rule sometimes needs to be added to the updateRules() method on any field that is required. 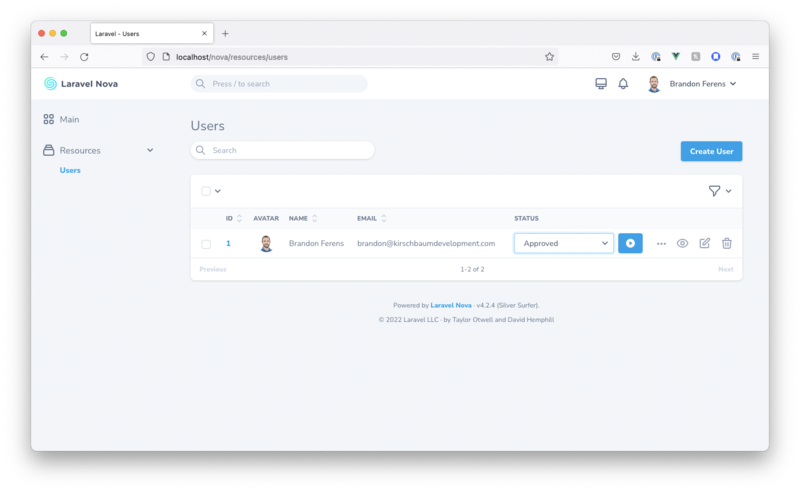 If you discover any security related issues, please email brandon@kirschbaumdevelopment.com or nathan@kirschbaumdevelopment.com instead of using the issue tracker. Development of this package is sponsored by Kirschbaum Development Group, a developer driven company focused on problem solving, team building, and community. Learn more about us or join us!